An innovative product which aims to revolutionise the hospitality industry has won a top business award. Shepherd Filters UK scooped the Service and Maintenance Initiative of the Year honour at the H&V News Awards 2018. The company, run by Stirling-based entrepreneur Simone Hart Sibbald, installs environmentally-friendly kitchen grease filters made of antipodean wool in commercial premises. The product, which drastically reduces the risk of kitchen fires, has also just been nominated for the Business Innovation Award at the CIS Excellence Awards. Shepherd Filters CEO Ms Hart Sibbald officially launched the innovation, currently being trialled nationwide by a major restaurant chain, in the UK in January of this year. “This is the first time we’d entered the filter for an award and we were over the moon to win. They liked the environmental benefits compared to traditional grease extract cleaning which uses water and chemicals and creates hazardous waste. “Because Shepherd Filters are made from wool, the product is biodegradable and can easily be disposed of with food waste. Shepherd Filters are an innovative alternative for the food and hospitality industry which cut the risk of fires significantly by reducing the build-up of grease in kitchen extract systems. They capture up to 98% of airborne grease before it enters the system – compared to regular metal filters which catch around 20%. 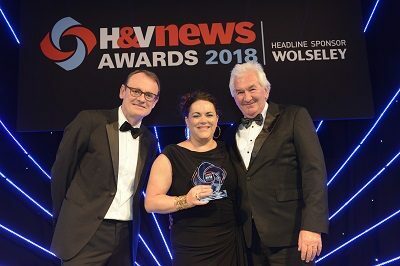 The initiative beat off competition from three other companies to win the H&V News Service and Maintenance Initiative Award for firms working in the Heating, Ventilation and Air Conditioning (HVAC) industry. “Our winners demonstrate the passion, the pride and the performance this industry offers. The filter has also been shortlisted for the annual CIS Excellence Awards which recognise creativity, innovation and excellence in the Scottish hospitality, catering and tourism sectors. Shepherd Filters UK are up against Chefs Eye Tech, a food waste reduction technology, and The Scottish Salmon Company for the Business Innovation accolade with the winner set to be unveiled at a ceremony in Glasgow next Thursday May 31. “We’re delighted with the nomination and looking forward to going before the impressive panel of judges to tell them more about the product. The firm will also be exhibiting the filter at the Commercial Kitchen Equipment, Services and Design Show being held in Birmingham next month (June 5 and 6). Published by Blackburn Communications on May 22, 2018. As featured in The Stirling News, The Stirling Observer and Catering Insight Magazine.